Well It's True That In My Manners…. ….there’s been something of a lapse…. PS. I started the New Year with one of these, so it is only fitting I close with one too! PPS. The blog will get a major upgrade within the next few days. Stay tuned! Edwards For Prez – Round Two. I still think the Democratic primary nomination is Gore’s, if he decides to have another crack at it. 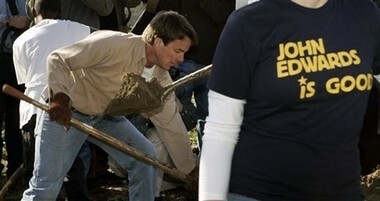 What I think is interesting about John Edwards digging his way into the race is not the man himself, but the mindset of people who are latching on to his candidacy and functioning as his campaign cheerleaders. I drive around a lot which affords me the luxury of channel surfing the radio. I sometimes listen to Air America to get a glimpse of the left perspective. The far left contingent, Randi Rhoads, Rachiel Maddows (*sp*) are enamored with him, and have been talking up his candidacy for months. What I don’t get is why, to them, Edwards is so much better a candidate than Obama Barrack. Lets compare. Edwards is young-ish, but Obama is the genuine article as far as youth goes. They are both one-term senators, but unlike Edwards, who wasn’t polling well in his district and didn’t seek a second term, and lost big in his party’s presidential primaries, Obama is a politician on the rise who seems poised to be a multi-term senator if he chooses. Though his national political career is short, Edwards, through his attachment to Kerry, already comes off as part of the establishment, while Obama is indeed a fresh face. They both hold law degrees, but, unlike Edwards, Obama doesn’t champion himself as a lawyer. I know that at least 2/3 of the ex-Presidents had been lawyers, but few of them, to the best of my knowledge, had used their lawyer status as a selling point. (Jeffeson came to hate the practice during his career as one). You know the old saying – everyone hates lawyers… until they need one! My question is this: How is Edwards going to make the case that we need one as President? PS. Though it has much lower ratings, and they often come off as complete loons, I find Pacifica Radio broadcasts to be much more interesting and compelling radio fare than most of the Air Americas lineup, which comes across as nothing but bitter partisans who copy and employ the worst techniques commonly used by Rush to envoke emotional responses. PPS. At first glance I thought the shirt read “Edwards is God” and immediately I wondered if Eric Clapton would sue. Pseudo Hat Tip: Althouse, who lately seems to be taking up quite a bit of my time. If You Can Say It – You're A better Man Than I! 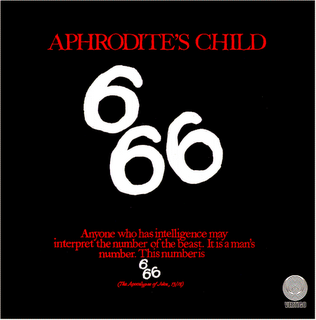 It’s the term for people who fear the number 666. Question: What is the term for people who invent words that are unpronounceable? Hat Tip: BBC News via Slashdot. â€œItâ€™s highly coincidental,â€ said defense attorney Joseph Cheshire, that the charges are being dropped a week after the director of a private DNA testing lab acknowledged that he initially, with Nifongâ€™s knowledge, withheld from the defense test results showing none of the playersâ€™ DNA was found on or in the accuserâ€™s body. This prosecutor, having changed his story more times than the accuser, now has less credibility than she does in the case. How can this case still be judicated, how can he still be working as a prosecutor after this. UPDATE!!! Well, that didn’t take long. The North Carolina Bar has been looking into this since April. Good for them. PS. Yes this was posted a week or so ago, but if I update it but don’t move it up, no one will see the update. It’s my blog and I can do what I want here. (Link Is Probably NSFW) I am horrifiied that I feel compelled to see THIS MOVIE!!! Anyone who knows my family knows how much music has been intertwined into our little corner of the social quilt. Back in the ancient period classified as the 1970’s BCD (Before Compact Disks), the siblings and I would sit around the table listening to our favorite LP’s, singing and harmonize along with our favorite artists: Simon and Garfunkel, The Kingston Trio, Chad Mitchell Trio, Peter Paul and Mary, and The Eagles, just to name a few. Debbie sang in the Cal Poly San Luis Obisbo choir. Brenda, Jeff, and, later, Rob learned to play guitar. Mary Beth and I were in grade school and high school band together, MB playing trombone and clarinet, and I played baritone horn (we both quit because we hated the high school band teacher; we thought he wasn’t very good at his job – hey, we were 16’ish and knew everything). Jeff, Rob and I are, or have been, in various bands for the last twenty years or so. So many memories of Mom learning to play piano. Debbie, Brenda, and Jeff still play the beast. 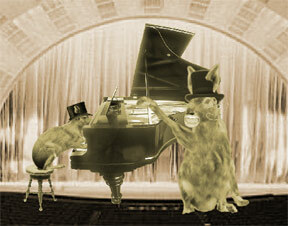 Even I have tickled the keys at one time or another. And then there is Dad. I would love to say that Dad was an orchestra conductor or a trombone player, or played the sax in a rock or swing band, but as far as I know, he didn’t. There is only one musical instrument that comes to mind when I think of my father – a red, hollow body, electric guitar. I don’t know what brand it was or if it was a collectors item; for all I know, it was an ordinary guitar. And I don’t remember ever seeing him play the thing, and don’t know if he ever did or could. It is not the playing of the instrument that brings it to mind, but more the departure of the thing that makes it so special. He sold it at the neighbors garage sale in or around 1973. I haven’t a clue how much money he got for it or what it was actually worth, I just remember that it was a pretty red guitar. So why is that red guitar so important? I’ll explain. Dad loved music too. He loved those groups we used to sing to, and when we would sing to those records, dad was there singing along, or more often just listening to the voices of his children. He would sing songs to us at bedtime when we were little kids. One favorite was “The Fox”, another was a pirate shanty called “The Keeper of the Eddiestone Light”. Dad was always curious about or bands, and was proud of his musician sons and daughters. But he never played. He never had time, what with raising six kids and all. I didn’t think much about the guitar at the time, but later it became a symbol of sacrifice, a concept you only really understand when you become an adult. I never asked him about the guitar or why he sold it, but it came to represent the choices we make in life, to give up one thing for something more important – family. One the day of his passing, during the last fading hours of his life, Debbie, Mary Beth and I sat in Dad’s hospice room for some time, singing and harmonizing to songs from the first two Simon and Garfunkel albums. MB and I even included made up and joke lyrics – “fools said I you do not know, silence like a casserole (instead of cancer grows)”, “and words, like silent raindrops fell, GO TO HELL”. We laughed and cried. Dad was at that point a shell. Anyone who has been through the death watch of a loved one knows this final state; where most of the organs have stopped working, but the clock that controls the breathing reflex and the heart has not quite wound down. The man we knew as our father was already gone. But if some part of him was still there in those last moments of the man, Dad would have been thoroughly amused. PS. In the song “Eddiestone Light”, there is a lyric about the mother sitting on a buoy. Well, when we were kids, we didn’t know there was a floaty thing called a buoy, so we could never understand why the mother would sit on a boy. Poor kid! He’ll drown!! What a horrible woman!!! Just want to wish all y’all a Merry Christmas. I feel a feverish post coming, but I have to go to the pseudo-inlaws soon and don’t have time to write. Talk soon. Ha!!!! I beat you Bill Gates. I DARE, no, DOUBLE DARE you to sue me… oh crap! They have a patent on that “two”?!?!?!? Hat Tip: The Onion via Madison Man via Althouse. It just dawned on me on an emotional level – my dad, before he slid into his final decline, asked if Greg, my partner, was coming to visit. My Dad accepted Greg as part of the family and wanted to see him before he passed away. Yes. I am crying. I love you dad. Read the post titled “In Memeory Of…” before reading this. I don’t recall the exact year, but in the early 70’s dad built a device that could have replaced the “Speak and Spell”. About the size of a bread box, the “Teacher Toy” was made from a gutted reel-to-reel tape recorder. You would put a flash card in the slot on top of the box, push a button, and the card would move from left to right. The flash card was a standard index card that had a drawing of an object on one side and a strip of magnetic tape on the bottom of the other. As the card moved across the slot via a set of pulleys, the name and spelling of the pictured object would be read aloud from the speaker within the box. The one card I remember was a drawing of a trout. Because the “Teacher Toy” used flash cards, you could have an infinite number of objects to display and spell, unlike the “Speak and Spell”, which is limited to the 12 items pre-programmed in the box. It may sound antiquated by today’s technological standards, but for us the “Teacher Toy” was just short of magic. My dad was Mr. Fix-It, and tinkered with all manner of devices, from radios and TV’s, to just about every single car we ever owned. I’m not sure if I can call my dad an inventor, since the “Teacher Toy” is the only thing I can recall that he built from scratch, but since I am the 5th child of six, he may have built other things I’m not aware of. What I am sure of is that I inherited his talent for fixing stuff. That will be the topic of the next “My Dad” post. PS. The picture of the trout was drawn by Dad. Did I forget to mention Dad was pretty talented with a pencil and drawing pad, a talent I definitely DID NOT inherit.